Frogmouth birds are big headed animals they are deep yellow eyed specie, have short legs and their feet are greyish-brown. They are known for their flat hooked beak and by their frog-like gape, which they use to capture insects. A Potoos Silverspot on a tree. It hunts usually invertebrates and small vertebrates such as frogs and mice. It can catch flying insects, but most of time it sweep down its prey on the ground. Frogmouth is the weakest flier. It has rounded wings with medium length. All of them are nocturnal they are often mistakenly seen as owls due to their similarities. Frogmouths and Owls both have spotted patterns or skin coloring, broad eyes, and anisodactyl feet. Yet they have different ways of catching their prey, owls possessed strong legs and toes with a distinctive flexible joint furthermore they use their feet to catch their prey while frogmouths prefer to catch their prey with their beaks and have fairly weak feet. 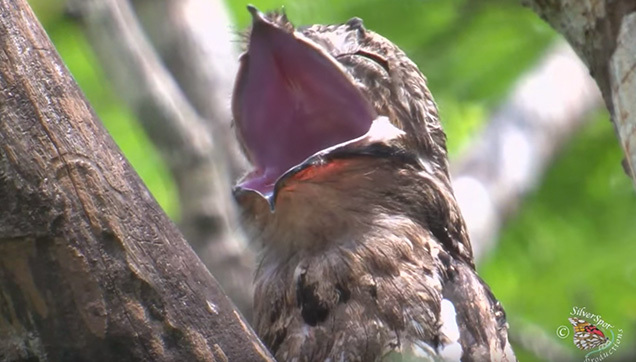 Frogmouth lives in a tree covered areas, wet tropical forest, trees in urban areas such as parks and gardens. Thank you so much for dropping by and reading this article. Visit our website regularly for more interesting and trending news and stories. If you enjoyed this post, please share this with your friends and if you have any comment, please write below. Thanks! Find out what this toddler did which made millions of netizen's hearts melt! Does Chemotherapy really Cures Cancer?